One of the cables from distrubutor was broken inside the "cabelshield" about 2 cm from connector (engine vibration?) guess if i was happy when the car starts at last !! 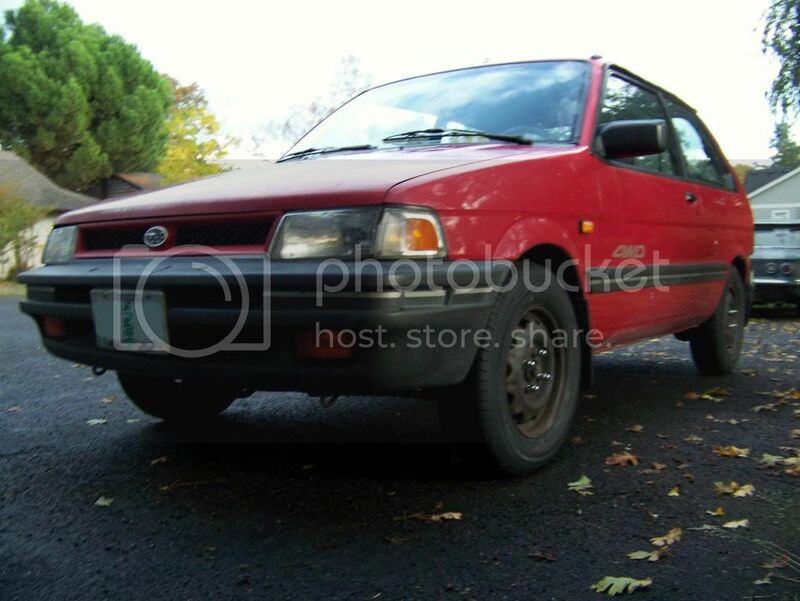 I just bought a 1990 4wd 1.2 single injection Justy. Check engine lamp is on and fuelpump is on for 2 sec and stops. "Pickup coil" in distributor give 1V ac then cranking so i suppose it`s OK ( 900ohms ). Last owner told me in Was weak and idles poor before it stooped. What could be Wrong??? any Ideas?? ***michel***, welcome to this forum. Here is a thread from earlier this year that might help you. I have only 2 cables black and white to distributor. is it possible to check if pickup coil is bad? Yes it is the right diagram, the wire colors do not match by all years for gen2 carb engines (by my findings). Yes the relay looking box wired in-line to the coil is the ignition control module. 1. Disconnect the distributor, place muti-meter (DC voltage) across black and white wires from distributor, crank engine to turn distributor. Do you detect a trigger signal of a volt or few from the inductive pick-up? 2. Disconnect the ignition coil itself (from the ignition module), place a test lamp across (blue & bl/wht) wires that supply the ignition coil. Crank the engine to turn the distributor. Does the test lamp flash? NO ---> Check black/white wire going into the ignition module for power (when ignition is switched on) , if power is good then you have a bad ignition module. The triggersignal from distributor is 1v AC , if i switch to DC it`s 0V. Are you sure its not an AC signal? Then i connect a 4w bulb to the wires that suply ignitioncoil a have no light. There are also 12v on black/white in to ignition module. Is it possible to check the ignition module? Are you sure its not an AC signal? Variable reluctor sensor's output is AC but sadly diagnosis is limited with multimeters. I knew that would be a point of contention, my digital multi has a low sample rate, meaning it would miss an intermittent signal in AC mode, but in DC I get enough response to see the signal ( figured any analogue meter would work better in DC for this as well ). Oh well. The timing module is solid state I do not know of a method of testing it other than trigger the input and look for a switched ground output to the coil. I found the coil + timing module in a pick-lot complete for 15$, It would have been 80$ for the timing module alone from rock auto. I have tried another ignition module without any luck. Are there any more sensors involved in ignition circut (crankshaft angle??) ? If camshaft is one teeth wrong does it still make spark? Is it common that EFC/PCM module breks? Does anybody knows what error code 40 means (4 long pulses) ? "Magnetic sensors can be checked by unplugging the electrical connector and checking resistance between the appropriate terminals. On the Rover 820, for example, the sensor should read between 1200 and 1450 ohms"
You are not counting the chrysler ignition module you claim to have tried are you? Did you get a Justy ignition module from a pick-lot (roll of the dice) or go buy one new? Sounds as if your coil is good, and you are getting trigger signal from the distributor. There are no more parts to this specific system. Not sure about the timing belt, most cars will still run (badly) if off by a tooth on the belt. Only been involved with Justy's for a year now, but I cannot recall anyone posting about a failed FCU, perhaps others who have been around these critters longer could lend some insight. Code 40 doesn't sound right, with much patience read for codes again. If you are getting constant long pulses (~1sec even interval on/off), then it means you are good and have no active codes in memory. It is supposed to just keep long pulsing the CEL in "test mode" (green connectors only) if there are no fault codes. Coil and module are borrowed from pick-lot from a Justy. maybe both modules are broken i hope i did`nt have to by new expensive parts, but i guess i have no choise now. I have 4 "long pulse - short pause" followed by long pause. and then it starts over. Strange?? No error code at all with black connector connected, but check engine lamp flash continusly. You have only 2 cables to distributor yet the carbed wiring diagram doesn't apply to your vehicle? What does single injection mean? Forget about diagnosing your 'module' by measuring resistances; semiconductors don't work like that. You might verify operation by observing coil voltage with an analog meter while cranking. A constant 12V could either indicate faulty switching in the primary circuit or too slow of a meter. Again, ignition diagnosis is LIMITED with multi meters. Is there any spark between coil's secondary circuit and ground when cranking? rortor, wires sparkplugs cap ar all in good shape. The diagram shows a couple of extra black wires around the ignition system, they appear to be redundant. I have found reference to "single point injection" in a couple of places. I personally feel that if you have floats and metering jets, then you have a carburetor. **michel** again thank you for your patience, I know that purchasing a "not running" vehicle can lead to a good deal of stress and second guessing. I believe your description of the CEL lamp is correct and operating normal for a static engine. Hopefully your constantly lit lamp will go out (as it should) when you actually get the engine started. I have borrowed a ignition control module that I know is OK.
yesterday i bought a very rusty but running -88 1.2 Justy. Since distributor doesn't have ignition advance weight on-90 i replaced the sensor inside distributor. 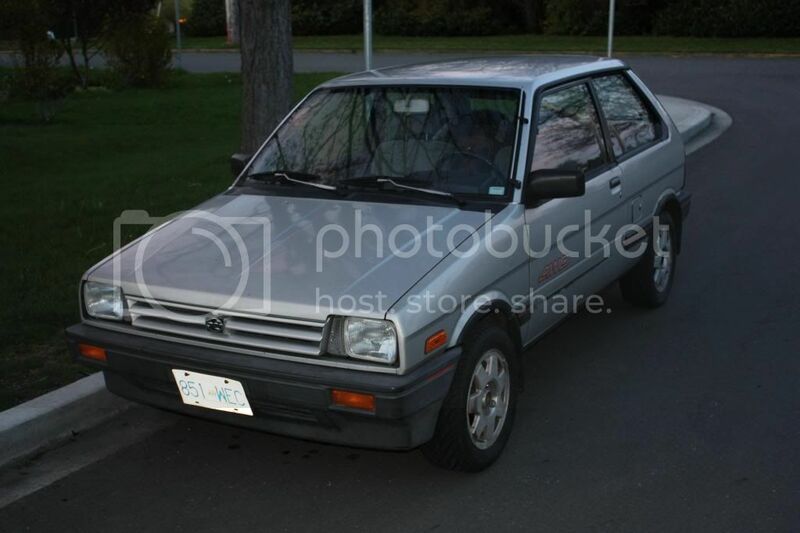 Rusty but trusty Justy, a must-see! The EFC does not control the spark on an 88 Justy. There is a module called the "Ignition Unit" (or something) that sits near the EFC and receives the input from the distributor. I would not jump to any conclusions just yet about the EFC or the module, I would simplify. I have never heard of one of these failing. However let this diagram help! on mine -88 Justy the "ignition unit" was located beside the EFC as you said. But on my -90 the only thing i found is the "igniter / ignition module" beside the Ignition coil and i have replaced that one already. Spark plug/wire/cap/rotor replaced with new. pickup coil inside distributor / ignition coil / "timing module beside coil" replaced with 100% OK units from a car that runs. +12v on black/white to ignition module and coil. 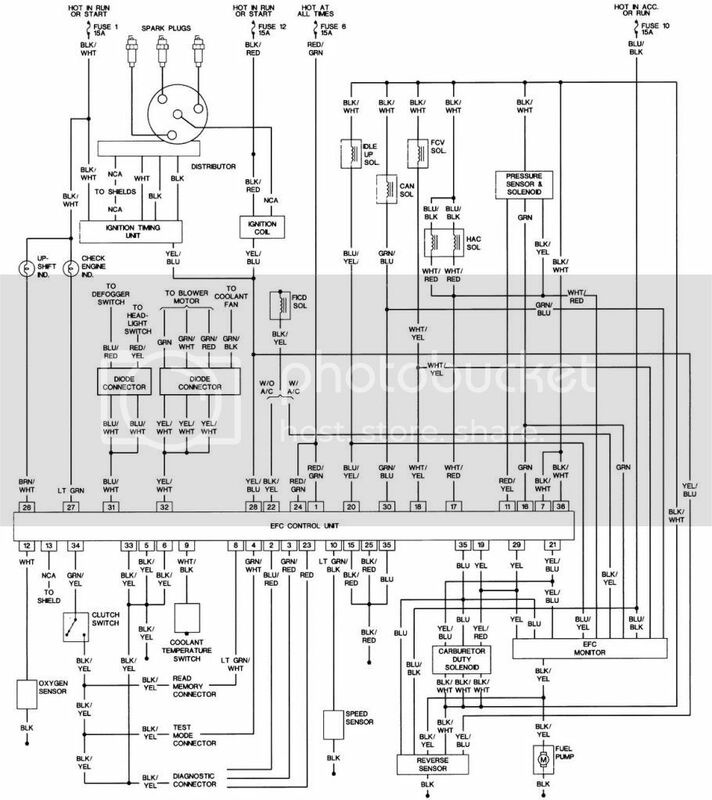 I`m pretty sure i have a problem with the signal to the ignition module, i cant follow the cables because the colors don't match the diagram i have. the closest i come is the diagram for -92 MPFI that one has the correct igniter/coil setup but i have only 2 cables to distributor i also have carburetor injection not MPFI on my car. Are you sure that the EFC does not control the spark on -90? maybe a stupid question I have noticed a strange sound like relay clicking/fuel nossle from the carburetor area, then ignition is on, sounds continuously 5-10 click/sec. and only on my -90 not -88.
if it makes you feel any better i have a 88 and it makes that clicking noise to, runs fine thought doesnt idle till its warm but other than that its fine. PLEASE: easy way to install hitachi carb? it took HOURs for 2 front nuts last time! My 89 Gl makes the same noise at the carb when the ignition switch is on. I am pretty sure it is the sound of a GOOD functioning duty solenoid inside the carb. It is a faint sound. Almost like a watch ticking. Not like the clicking/clacking of my FCV ( float chamber ventelation ) solenoid, which sounds off now and then.